I’ve told you about our love for reptiles and slimy things, but I have yet to tell you about our furry buddies. Our two dogs are pretty awesome little friends. First, you’ll meet Balls. 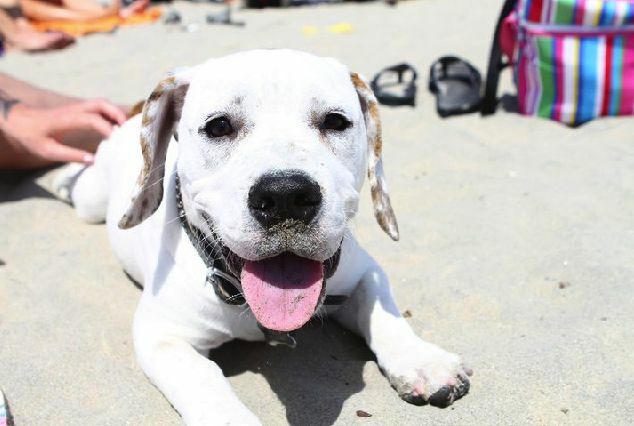 Balls is what is called a Beabull- a mix between an English Bulldog and a Beagle. They mixed these breeds in order to get rid of some of the common genetic problems with English Bulldogs but the mix isn’t very common. If you ever Google “beabull”, you’ll see what I mean. We aren’t typically the type to buy dogs from puppy stores or breeders, we like to adopt. 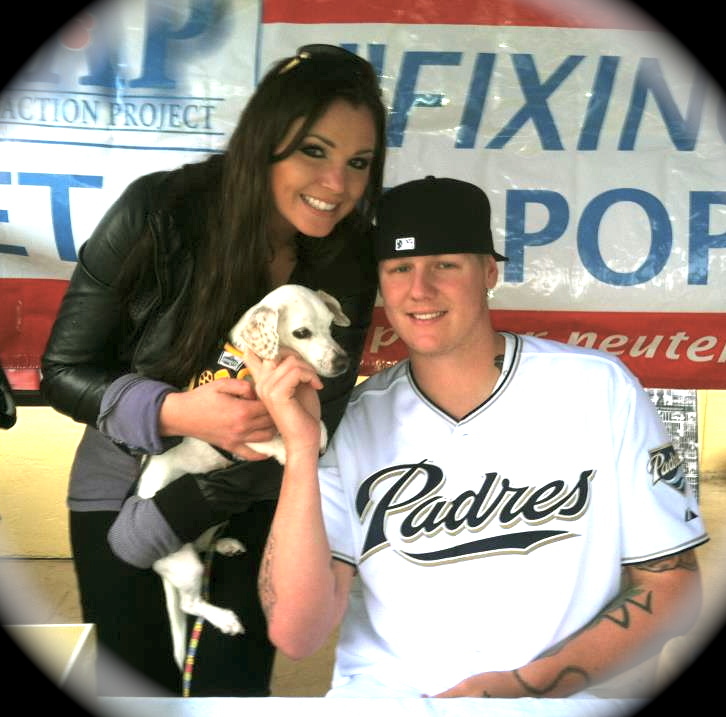 On one fine day of Spring Training 2010 however, we found ourselves wandering around a mall and into a puppy store. If you could have seen this puppy’s face and chubby little body, you might understand why all of our sense of reason just went out the door. After about 30 minutes of playing with him, we ended up claiming him to be our own. That same day, a story hit the press that resulted in what our very mature minds considered to be hilarious headlines. People often giggle or stare with a face of shock when we tell them that our dog’s name is “Balls”, but I would bet you 4 chicken strips that no one even comes close to imagining why that’s actually his name. In 2010, Mat signed some controversial baseballs in good humor and as a joke to be sold for charity. As I expected, the joke was missed and the sports world was shocked, offended, amused, excited- basically anything but unaffected. We wished the issue wasn’t getting some of the negative attention it got but you just can’t control that. There is always going to be someone who takes it too far and more over, someone who doesn’t understand or report the full story. We dealt with the unpleasant attention that day by making jokes about the headlines and tweets we were reading on the web. Most of them read something like, “Mat Latos’ #balls…” blah blah. It seemed that EVERYONE was hash-tagging the word “#balls”! So much so, #balls was the number 1 trending topic in San Diego that afternoon. By the time we got our puppy, the word “balls” had brought us so much laughter and joy that day, we decided that we had no choice but to name him “Balls”. For the record, when children or veterinarians ask, we tell them his name is “Meatball”. There’s no need to leave concerned minds with questions regarding our parenting ability. As for our other puppy, Lillie is quite a different story. We were not planning on adding another member to our family when we adopted her at an adoption event last off-season. We had heard about an organization called SNAP SD (Spay and Neuter Action Project, San Diego) and decided that we would do whatever we could to help them out. Before Mat and I met, we were both involved with helping the humane society so this was a cause we agreed on without question. I absolutely LOVE this organization. Not only do they provide low cost spay and neuter services in lower income areas, they also foster animals who have been determined un-adoptable by shelters for various reasons along with some that are on the list of animals to be euthanized. The issue with shelters is that they don’t really give stray, abused or older animals a great environment to adjust in and often make these animals behavior decrease on a scale of desirable pet attributes. The wonderful women and men who take these animals in until they can be adopted are a blessing. They bring these animals home and care for them in a more calm environment until their temperament is one that would be desirable by a pet owner. Eventually, they make their debut at an adoption event and in most cases, go home with new families. Mat and I volunteered to host an adoption event and Mat volunteered to auction off a signed jersey and also sign anything people wanted in exchange for a donation to SNAP. 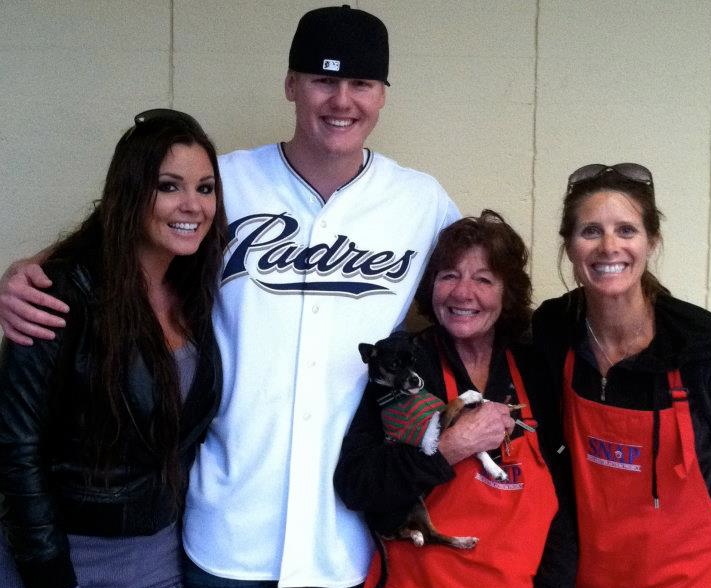 The event got rained out but we stayed under tents outside of a Petco all afternoon anyway. The whole time we were there, I had my eyes on a white Doxie mix. She was so sweet and cuddly and her coloring matched that of Balls’ coat. My girly mind was telling me, “It’s a sign! We have to take her home!”. I didn’t have to say this though because Mat could already see it in my eyes. I didn’t bug him too much about it. The afternoon turned out a little slower than we planned but we still raised enough money to fund a spay and neuter clinic for 50 animals and none of the animals had to return to shelters or be euthanized. To me, that was a HUGE success for a rainy day! (I should note that it never rains in San Diego, so if you’re anywhere else in the world, imagine what people do when it snows). Mat had asked for the paperwork to take Lillie home when I wasn’t paying attention and before I knew it, I had a new buddy! Here is me being a terrible parent and dressing my dog up. This is not a regular occurrence. 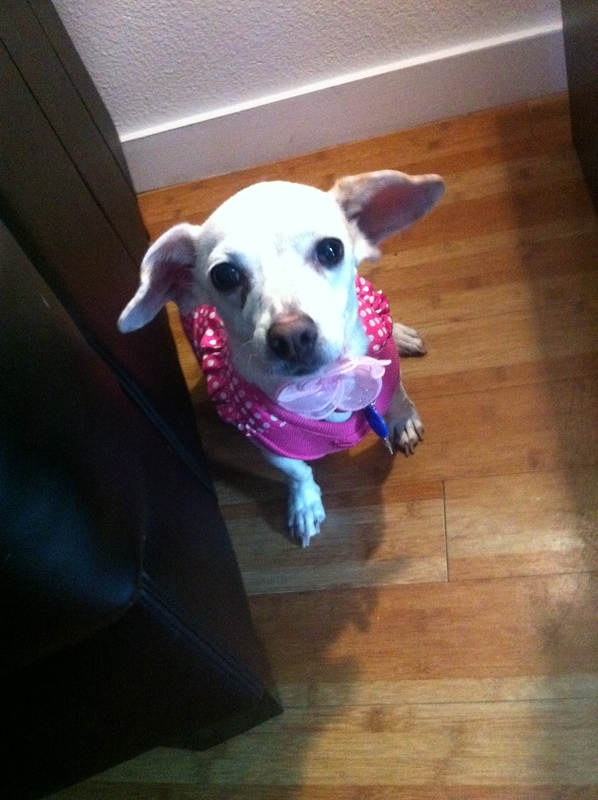 While I love both of our dogs unconditionally, I encourage you to always check local shelters when seeking a pet. Many of them will even work with you to find the type of animal that will fit best in your home. It may be more of a challenge but every animal deserves to live and wants to be loved. That’s so cool that they have the same ears! They’re both adorable. I think adopted dogs are better, anyway (my biased opinion). They know that you saved them from a sad life and they appreciate it. All three of our dogs have been adopted. ur canine ‘babies’ r adorable. I had never heard of a beabull b4. do u plan to bring them to Cincy with u? So glad to see a rescue! And sometimes “rescuing” a puppy from a pet store is just as merciful! 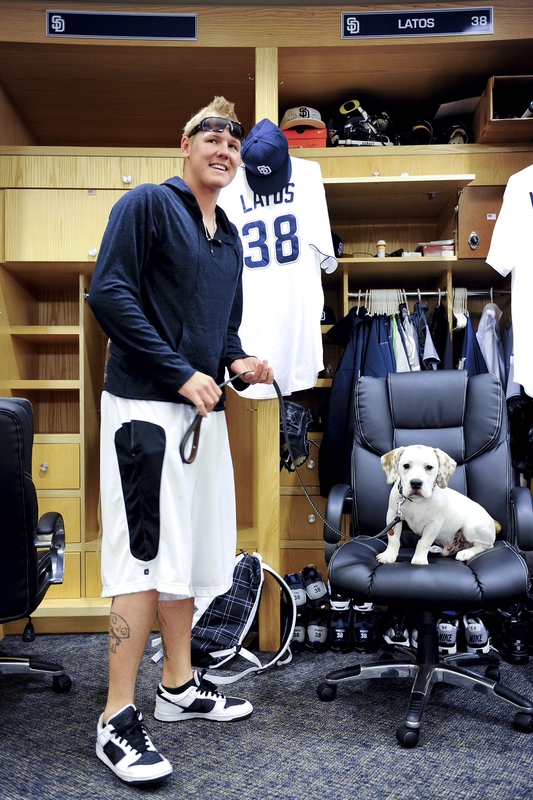 You should bring ’em to Bark in the Park at GABP this year! so glad you and Mat took the time to help at the SPCA- after reading and sharing this blog HOPEFULLY others will do the same. Welcome to the Reds family! Reds fans are excited to have Mat on the team! Dallas, Balls is awesome! Love the pic of him on the beach. I’ll shoot you a pic of my dog, Aix, the French Bulldog, on the twitter tip. Deuces. Hi! My good friend and co-worker Christy Schuckman, Reds PT, told me about your love for animals. My husband is a retired player himself (Zach Day), and got into the dog toy and food industry when he was done playing ball. As a result, we have a dog blog on Cincinnati.com and on Fridays we try to feature local celebrities and their dogs! I would love to feature you, Mat and your pets! Our local dog food delivery business is called Naked Dingo (we focus on healthier/wholistic foods). You can check it out at nakeddingo.com. If you are interested just email me back or have Mat talk to Christy in the training room. Thanks! P.S. We have two Doxies ourselves and LOVE them!!! Love all the work you guys do for the humane societies.